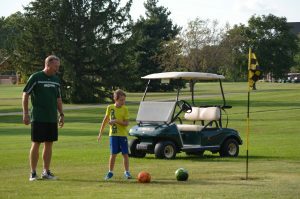 The FootGolf course at Hickory Point is integrated into the front 9 of the golf course and features 18 holes with par 3s, par 4s, and par 5s. Each hole has a recreational and competition tee. This growing sport merges golf and soccer into one. Players keep score like golf while kicking a soccer ball down the fairway toward the checkered flags and into the cup. The player with the fewest shots is winner of the round. Fee is $10 per person to play. Soccer ball rental is $3 or bring your own. Golf carts can be rented for play. Give it a try! Course map, rules and scorecards can be found below.